We finally started school full-time for the new school year. Amber is now, officially, a 5th grader. This was the first start of a new school year for us as homeschoolers, since we began homschooling in the middle of 4th grade. Fred wanted to do something special to mark the beginning of the school year, but everyone was asleep when he left for work on Monday morning. 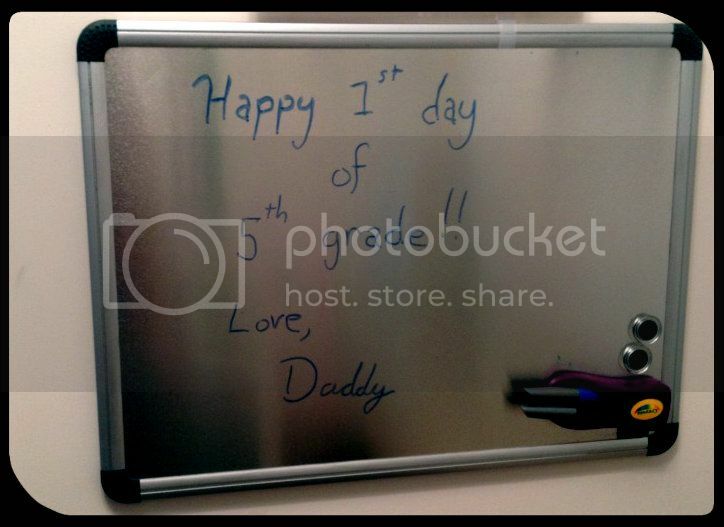 He had to settle for leaving a sweet note on our school dry erase board. The first day went well, with just a few "let me figure out what we are doing" moments. Amber was very patient with those moments, but they also let me see that some of the curriculum suggestions are a little awkward for us. We have tweaked a couple of them already to suit us better. Our religion curriculum went shockingly well. I didn't expect it to be such a drastic change from last year, but we had good discussions all week and Amber really *got* what we were discussing. It wasn't the standard answers of "Jesus", "God loves me", or "as I want to be treated". Those answers really lose something when 2/3 of your discussion questions end with those answers. All the agonizing I did over finding the right religion curriculum seems to have paid off. I do highly recommend it, however, it isn't going to be to everyone's taste. It is Lutheran (Wisconsin synod) pre-catechism curriculum, with very Lutheran view points and some lessons straight from Luther's Small Catechism. If this doesn't bother you, then it is a wonderful option to consider. The discussions are engaging and include real life applications that don't feel contrived. We also started a new handwriting curriculum this week. Amber has been struggling lately with her handwriting. It is legible and, honestly, passable even if it never improves. However, it used to be beautiful and it degrades each year to where it is tiny and harsh looking now. Amber chose a curriculum with a different type of lettering than what she originally learned in school. We are hoping this will help her loosen up her style a little bit. I also took away her mechanical pencil for all subjects, except Math. She writes nicer without it. I don't know if she hold it differently, if the lead feels different, or an entirely other factor, but her handwriting is close to awful with the mechanical pencil. So far, she likes the curriculum and there has been a small change in the quality of her writing. Improved already! Thanks BJU Handwriting. Wednesday we took a little school break, already, and spent the day with my mom. It would have been my dad's 71st birthday and nobody wanted Mom to spend it alone. We had a fun day with her and then drove her the hour and half to my sister's house where she is spending a few days. My sister's oldest child started Kindergarten on Thursday and she invited Mom to spend that time with them. Bonus for us all was stopping by my sister's work and watching the newscast live from the studio before Amber and I returned home. 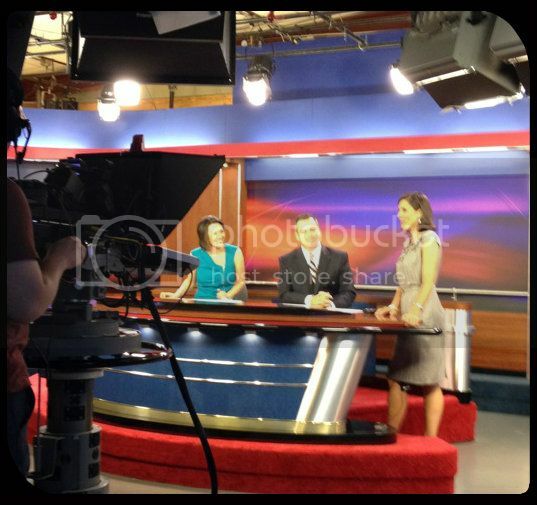 My sister is a news anchor / reporter. While we were taking a school break Wednesday, several local school districts and both of the parochial schools that Amber previously attended had their first day of school. 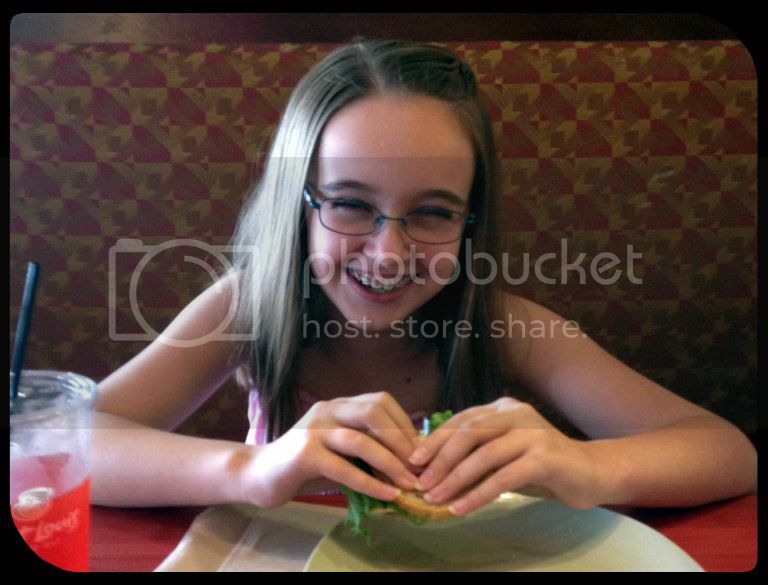 I had mixed feelings seeing all the happy-faced children in back to school pictures on Facebook. I fear, sometimes, that Amber misses being in class with the other kids. Then, she adamantly reminds me that most days she didn't truly enjoy being there. Still, Wednesday was all-around not one of my happiest days. This week we finally had our Tea and Scones event that Amber had been looking forward to ever since we agreed to do the UK study. Our summer just became crazy and there was never time to bake and enjoy the food in the same day. I must say that the scones were quite a treat and we may have to do this more often, but with a different tea flavor. The British really have something here. 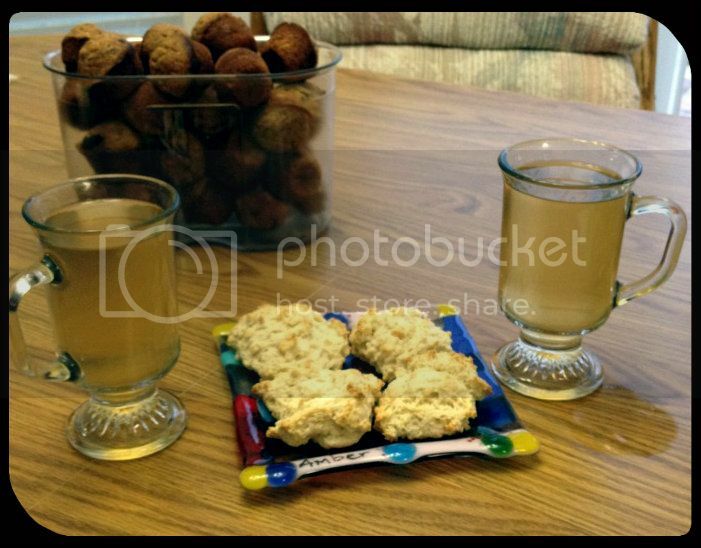 Traditional English Scones with Strawberry Lemonade tea from Teavana. In the evenings this week we have been watching The Blue and the Gray mini-series from the early 1980's. I looked high and low for an enjoyable video to watch on the Civil War; something akin to Liberty's Kids. But, sadly, there was nothing. 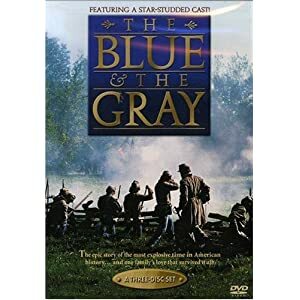 I did remember really enjoying The Blue and the Gray when I watched it at Amber's age, so decided to purchase it for us to watch during our Civil War study. Honestly, I'd rather be watching the North and South miniseries (first or second one.. third was awful). I loved those books; I own those books. But their historical value is somewhat limited and the content is really not suitable for Amber's age. I was several years older when it first came on TV, and not nearly as sheltered as Amber. Amber enjoys watching The Blue and the Gray each night and it has been an eye-opening experience for her. She didn't quite grasp what a war between the states meant logistically. The battlegrounds are people's backyards and civilians were injured and killed. It's very different to read about a battle in a book than to see, even a Hollywood version, of what the conditions were truly like. This has actually been my favorite resource this week, aside from the surprise success of the religion curriculum. Our new approach to Language Arts, which includes an English curriculum, Literature assignments and dedicated Creative Writing instruction & writing time, is going great. I'll write more about this soon. I'm tickled pink that this is working out so well and Amber is enthusiastic about it all. Our week was too busy and hectic to decide if the four day core subject school week is going to work for our schedule all year. Today, Amber is definitely enjoying the lighter Friday schedule. She went to sensory therapy, completed her Latin & handwriting lessons, and now is playing with a friend before swimming later this afternoon. Personally, I've enjoyed reading tons of back to school blogs the last couple of weeks. I find it intriguing to read about the curriculum that other people have chosen. I've been taking notes and bookmarking curriculum ideas for next year, already. I might need to put a personal moratorium on reading curriculum blog posts soon, otherwise next year's curriculum may be purchased prior to this year even getting off the ground. It was a busy week but it feels good to be back into a routine with goals to meet each day. We have been sleeping a little later than I'd like, but we obviously need the sleep. This is definitely one of our top benefits from homeschooling. I hope everyone had a great week too whether you are back to school or still on break. I love everything that you're doing with your daughter! It sounds like you've gotten off to a great start this year. My best friend just started homeschooling, and she's doing BJU's handwriting too. She tried something different but didn't like it nearly as well. Thanks for taking the time to post all of this. I enjoyed it! Thanks. BJU's handwriting is significantly different from how Amber learned cursive, but she chose to try a different way. Hopefully, it's easier for her to keep up with over the years. Wow! A crazy productive learning week! I know you had some challenges, but, really, it sounds like a very good week back! Thanks for the advice. Today they sent Flubber home with Amber to use when she feels anxious. Appears she just build stress all day from everything. It's funny though because they gave her gloves to use to play with Flubber... she can't stand to touch it. LOL. We struggle with friends going back to school as well, but homeschooling just works best for us! 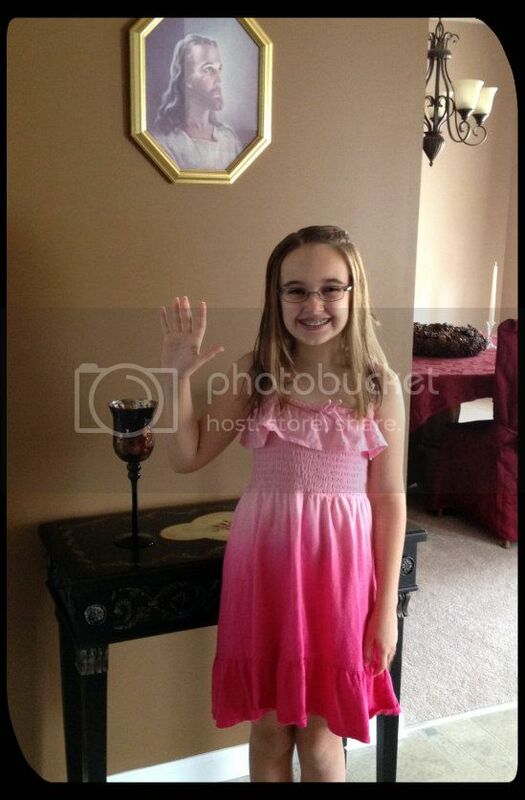 I love the picture of her first day (the pink dress is adorable)! Sounds like it was a full week! I have never heard of the Blue and the Grey. Thanks for the rec- it's nice to be able to write down these extra resources for when we study those subjects. We're easing back into a fuller schedule ourselves. I'll need to update my blog when we're back in full swing. I can't wait to see what you guys have been up to on your blog! Amber had fun during the Blue and the Gray keeping all the family members straight. They really emphasized how it split families as well as the country. Cousins, siblings, marriages, etc. We do school four days a week too. She has beautiful handwriting. :) Stopped by from HHM!